When the first electric trolley car entered service in Erie in 1889, it revolutionized public transportation in the region. Within a few years, Erie became a major trolley hub linking the eastern and central United States. With the exception of a 15-mile gap at Little Falls, one could travel from New York City to Chicago via Erie. Greater Erie Trolleys covers the network of trolley lines that operated between Erie, Conneaut, Buffalo, and Meadville. 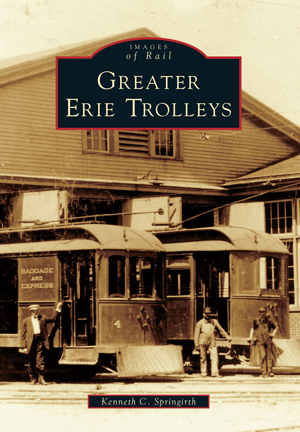 Greater Erie Trolleys illustrates the vital role trolley cars played in the expansion of the urban population. It documents the beginning of pleasure travel with photographs of the special trolley car excursions from Erie to Elk Park for picnics, dances, and sporting events. Ridership began to decline just as the automobile came on the scene and dirt roads became paved highways. Eventually the lines were abandoned, but the trolleys left an important mark in transportation history. Kenneth C. Springirth's father was a trolley car motorman in Philadelphia, and his grandfather was a motorman in Washington, D.C. Springirth has walked the lines and has photographed and ridden trolley cars in the United States, Canada, Mexico, Australia, Isle of Man, England, the Netherlands, Switzerland, Finland, Portugal, and Hong Kong.